Hollywood actor Leonardo DiCaprio’s weeklong Bicol trip has been cancelled due to "’miscommunication’ among the PR (Public Relations) company, the invited sponsors, and the group in touch with Leonardo in the States," reports Ricky Lo of The Philippine Star. Earlier reports said the eco advocate was originally supposed to lead an environmental awareness project in the region in August. He was supposed to stay at the Misibis Bay resort in Albay. Then his visit was moved to September to "help ’sanitize’ the image of the Philippines," according to Lo. "Initially, Leonardo would have been paid $1.5 million (roughly P70 million) for a weeklong stay which was cut to four days and then to just overnight, which was much too short for Leonardo to fulfill the itinerary. Sponsors have to get their money’s worth, you know," Lo said. Allegedly, the hostage crisis in August did not help matters. For more on this story, log on to PhilStar.com. 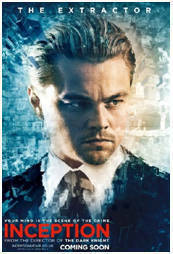 DiCaprio’s photo from the Inception poster.